← NOFO (North Fork, NY): Road trips should have fun activities for adults and kids. Have you ever taken the time to think about what’s in a name? The history behind names can be so fascinating. When one gets married in today’s age, some people change their last name and others do not for different reasons. I am excited to have another YOLO mom, Christine, as a guest blogger sharing her perspective on names. “I have always been a girl with a simple name. My parents named me Christine, which as a child my family called me Chris. I was a bit of a tom boy who loved sports and going fishing with my Dad so Chris was very fitting. My Dad always nicknamed people and called me Chrissy baby which was so endearing. My grandfather, Joseph Baltaitis, was Lithuanian and changed his name to White so it would be easier for business. Baltaitis translates to “white” in English. Short and sweet – Christine White. Easy to say, spell and remember. I was a happy girl with a happy life! Well one day I met a boy name Zoran Jovanovic. Everyone called him Zoro, how cool is that! Fast forward fifteen years and during our engagement, Zoro won a trip to Disney! So off we went with the Jovanovic family to Orlando. The hotel couldn’t find our reservation and had misspelled Jovanovic so badly it took a while for them to find it. I made a mental note to myself….. imagine checking into a hotel in China after 24 hours of traveling? I traveled a lot for business and sometimes it was hard enough checking in as White in some countries. Zoro and I got married four months later and when the priest asked me to sign the marriage certificate I asked him which name? So I signed Christine Jovanovic, which looked lovely on paper! So after a wonderful honeymoon, I came home and never changed my name. Seven years later, I was looking at a sonogram screen and saw my name in the corner and thought “Oh no, I will have a different name then my baby..Maybe it’s time to change my name now. “ I had been working in my field almost 20 years, was in sales and everyone knew me as Christine White. Well here I am today, the proud mother of a girl with a different name. Once in a while I will get a call at the office from the school nurse asking for Mrs. Jovanovic and my receptionist is caught off guard and thinks who’s that? What is the parenting life lesson? People change or don’t change their name for various reasons. It is important to be respectful and not make assumptions of why names may be different. Instead, find out the history behind the name which is always sure to be a fascinating story. Thanks for sharing, Christine. 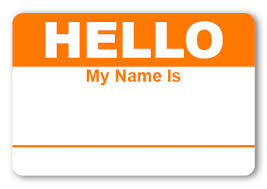 Posted in Positive Energy	| Tagged changing your name, getting married, What's in a name? Thank you. You are a much more patient and persevering woman! Good for you. Two names and double the fun!